Benjamin Disraeli, Richard Ford, Martin Amis, Ernest Hemingway, Orson Welles, García Lorca… There is a seemingly endless list of artists and intellectuals who have praised Ronda over the years. Few destinations in the world can boast the beauty, the wealth and the uniqueness of a town such as this, declared a Historic-Artistic site over 50 years ago. It”s difficult to put a number on all Ronda’s natural, architectural and artistic gems, let alone limit ourselves to highlighting just a few monuments. However, an emblem for the town does exist in the collective imagination: El Tajo (the Gorge) and the eighteenth-century Puente Nuevo bridge that crosses it. The bridge, almost 100 metres high with its semicircular arches, is the focal point of the most iconic photograph of the town. Less famous but equally beautiful is the Puente Viejo bridge, built in 1616. In the immediate vicinity, we can find the Arco de Felipe V and the Sillón del Moro (“the Moor”s Armchair”), a stone bench that was the setting to tales of kings and princesses in the days of Al-Andalus. 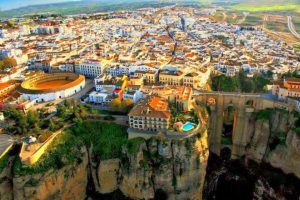 Ronda”s architectural heritage constitutes an extensive open-air museum, featuring a multitude of artistic styles and traditions. The Palacio de Mondragón, built in the fourteenth century and the headquarters of Ronda Museum, the Palacio del Marqués de Salvatierra and the Casa de San Juan Bosco, built after the modernist style, demonstrate the combination and dialogue between different styles, separated by just a few metres. Buildings of Arabic origin include the Casa del Gigante (“Giant’s House”) and the Palacio del Rey Moro (“the Moor King”s Palace”), where an imposing staircase cut from the rock of its grounds leads down towards the river. Whether of not you come during the town’s festivals, you can”t go to Ronda without visiting its Bullring. Ronda’s Real Meastranza de Caballería(Royal School of Cavalry) is a large arena that has trained many of history”s most legendary matadors, making it an essential stop for any bullfighting aficionado. The bullring was constructed in 1785 and is one of the oldest and most monumental in the world. Near the Bullring, visitors can see two monuments, dedicated to the writer Ernest Hemingway and the film director Orson Welles. Both men fell in love with Ronda, and the town wanted to return that affection to them. For Welles, this love would be eternal, as his remains rest in the town, specifically in the El Recreo de San Cayetano estate. The town of Ronda has lived through centuries of history and different civilisations and preserves remains of nearly all of these. The Romans, for example, left a fascinating theatre, in part carved from the rock of the land, and from the days of Al-Andalus we have the best-preserved Arab Bathsin Spain, as well as the Puerta de Almocábar gate. Ronda also has impressive museums, offering an interesting take on the town’s history and art. Some of the best are the Museo Municipal de Ronda, the Museo Lara, the museum dedicated to the famous writer Rainer Maria Rilke, the Museo del Bandolero (the Museum of Highwaymen), the Museo del Vino (Wine Museum) and the museum dedicated to the local painter Joaquín Peinado, located inside the Palacio de los Marqueses de Religious buildings also contribute to Ronda’s unique character. The church of Santa María la Mayor, the church of la Caridad, the convent of Santa Isabel de los Ángeles, the church of El Espíritu Santo and the convent of Santo Domingo, built by the Catholic Monarchs, are a few must-visit monuments in the town. Continue your visit with the temple to Ronda’s patron saint, the Santuario de la Virgen de la Paz (Sanctuary of the Virgin of the Peace), and discover the imposing altarpieces of the church of Santa Cecilia or the convents of Madre de Dios and San Francisco. The Iglesia del Padre Jesús church and the Templete de la Virgen de los Dolores shrine are also worth special attention. Finally, a surprise for the more devoted: the incorrupt hand of St Teresa can be found in the Iglesia de la Merced church. Malaga airport transfers can transfer parties of any size here from 256€ return for 4 people.